I was recently over at my partners house when I spotted something which looked decidedly like a muslin cloth in plastic bowl of water…Odd to say the least. Obviously I asked what it was and I was told it was a ‘flannel thing’ that he got in a skincare kit he received as a birthday gift from his granny and he had been using it as a cold compress. Anyway, it turns out that the skincare kit which he showed very little interest in was Liz Earle Cleanse and Polish for Men, which also came with the After-Shaving Moisturiser. Cleanse and Polish Hot Cloth Cleanser has long since been a popular product among women of all ages and I have used it myself in the past and was impressed with the results. The female version is aimed at cleaning away every last trace of make-up whilst dislodging the dead skin cells leaving fresh and clean skin. My partner was yet to crack open his Cleanse and Polish so I decided to give it a quick whirl myself. I was a bit worried about taking my make-up off with this cleanser as the male version is actually marketed as being ideal for men who are prone to breakouts and adolescent spots and contains eucalyptus oil, rosemary and cocoa butter, the first two of which I was worried would make it a little harsh for my eyes. However I am pleased to report it was very gentle and is every bit as lovely as the female version only with a slightly stronger scent! The idea is that the cleanser cleans away dirt and excess oil that can block pores, helping to reduce impurities that can lead to spot causing bacteria. Directions recommend massaging 1 or 2 pumps onto dry skin before rinsing the muslin cloth in warm water and wiping away the residue. Though I can’t comment on the long term effects of this product I was generally impressed with how it left my skin feeling after just the first use. I’m really hoping to convince my partner this is a great skincare product which is worth using, and though the muslin cloth step may initially seem like a faff, it is no more work than using your hands or a flannel to wash your face. Although, if I don’t manage to transform him into a skincare convert then at least I can use the rest of it myself…every cloud! 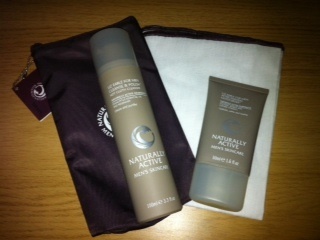 Visit the Liz Earle website to see the full range of mens skincare products.